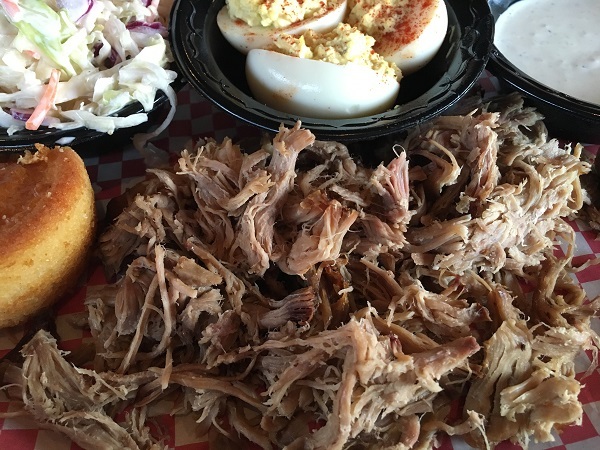 Bluegrass Barbeque, Moody AL – Marie, Let's Eat! The final stop on our Memphis trip was a fairly new barbecue place on the outskirts of Birmingham. It simply isn’t right to go through Alabama and not try some barbecue, you know? Because I am a complete dingbat, I totally forgot about a great little app that I downloaded last year. It’s called Alabama BBQ Trail, and it would have been incredibly helpful as we left downtown Birmingham. See, we were a little discouraged about the restaurant we planned to visit being closed, and the ladies were a little road-weary, and the barbecue place that I’d originally picked was another detour, although not a very long one, away up I-59 a few exits. We decided to find something along I-20 instead to get home quicker. 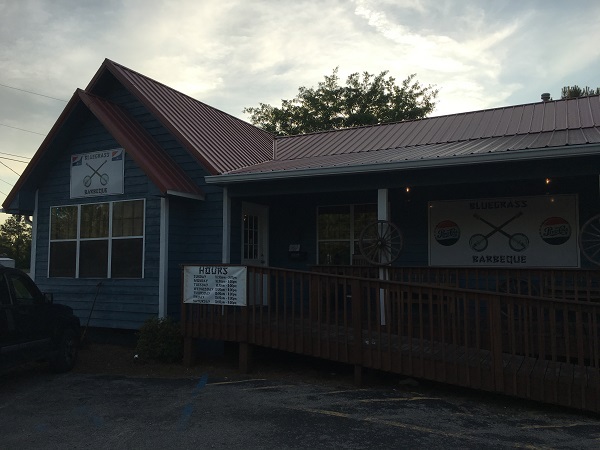 Google picked out Bluegrass Barbeque in the town of Moody for us, but if I’d been using that app like I should, heck, we could have visited one or two other places on the other side of Birmingham already. Shucks. Well, it all worked out in the end, especially since we sampled a couple of hot dogs along the way, and I’m happy to report that the last meal on the trip was a good one. Bluegrass is a really nice example of a good community restaurant, owned by the Crutchfield family and bringing in pretty big Saturday night crowds. The restaurant is still a baby in barbecue terms – it opened in 2012 – but the Crutchfields have put together a very traditional product with a solid, deep menu reflecting what I’d expect to find in this region. Deviled eggs are available as a side – and they’re delicious – and they’ve got a pretty good white sauce. The slaw was pretty boring and I only had a couple of bites of it, but the real draw here is the meat. The chopped pork is smoky and dry and really calls out for a little sauce. They do have a more traditional red-brown sweet sauce as you’d expect in the region, but many of the newer restaurants around Birmingham, such as nearby Rusty’s in Leeds, have included a white sauce as they opened in the last decade. White sauce is more common a hundred miles north around Huntsville and Decatur, but as word about the sauce has spread, and people keep calling it “Alabama sauce” (not the most strictly accurate description, but it’s stuck), newer restaurants have included it. We enjoyed our meal, gassed up ($2.05) and, as the sun went down, raced on home. That was a very, very good trip, although both Bluegrass and Sneaky Pete’s had me wanting to schedule a long Friday in Birmingham sooner rather than later. We’ll remember to use that barbecue app when we do it. Posted on July 22, 2016 by Grant G.Posted in alabama, barbecue, birminghamTagged alabama, barbecue, birmingham, moody. I have not heard of this place before. It sure looks good. Thanks for sharing it.